Three out of the four major components of a marketing research scan the present well-being of a business while the remaining one focuses on strategic moves that a business might make use of in the future in order to stay competitive. The Customer Component analyzes customers- behaviour, preferences, likes and dislikes. The Brand Component is responsible for the evaluation of the current success of the brand. 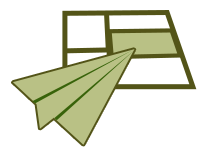 The Marketing Campaign Component assesses the success of the marketing campaign in use. The Strategic Component of the marketing research allows to keep finger on the pulse of the latest changes in philosophy of life, cultural and health trends that could influence buying habits of customers. Moreover, on the basis of the analysis of the distributors- and retailers- attitudes toward the brand as well as the analysis of the business-s successful competitors, the Strategic Component generates potential modifications in the marketing strategy that could lead to positive changes when adopted into the business practice. Efficiency of marketing research is to be evaluated to find out whether or not the obtained information benefits the company. Revenues generated as a result of marketing research is a popular indicator in this category. Also, it's possible to evaluate a series of financial kpis, like investment in marketing research, ratio of costs allocated for research of national and international markets. Download trial version of Marketing Research Performance Indicators. 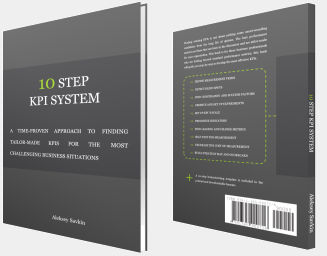 Purchase full version of Marketing Research Performance Indicators + bonus. Marketing Research forms a part of business research that aims at investigating some issues. There are basically two types of marketing researches- business to business market research and consumer market research. The former aims at investigating the buying habits of individuals and the latter is about screening markets for the goods and services offered by one business to another. Consequently, consumer market research revolves around understanding the behavior and conduct of people who constitute the 'target market' and the other one is about discovering the basics on which stands the business-to-business marketing model. However, both of the marketing studies have a single aim of 'focusing marketing campaigns more towards drawing revenues'. On the whole, marketing analysis is done with the purpose of 'digging' and 'constructing' answers to questions and difficulties confronted in marketing field. 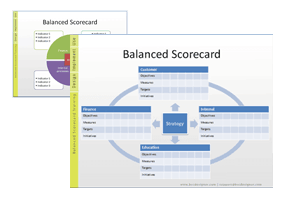 To carry out the tasks efficiently and accurately, one can utilize the approach of Balanced Scorecard. This has 'related' and 'relevant' metrics listed on it to ease out the job of 'measuring the steps and moves'. To end it all, counting the procedures can be done with this management strategy formulated in 1990s. Related metrics and KPIs for: Competitor Analysis, Benchmarking. Customers who viewed this item also viewed: Marketing Metrics. 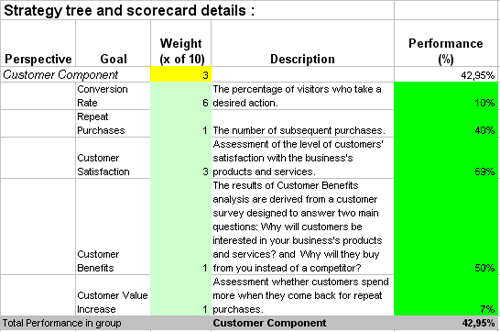 This is the actual scorecard with Marketing Research Performance Indicators and performance indicators. The performance indicators include: marketing research, customer component, conversion rate, repeat purchases, customer satisfaction, customer benefits, customer value increase, brand component, brand performance, product usage, market share, brand equity, marketing campaign component, attention level, motivation level, brand linkage, romi, strategic component, future target, weighty trends, business borrowings, friendly tips . 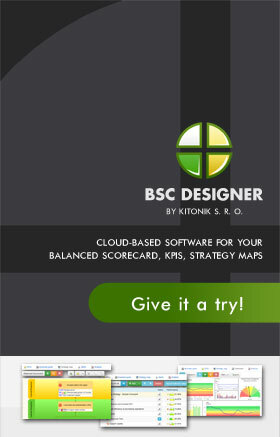 Download a trial version of Marketing Research Evaluation Balanced Scorecard or purchase a full version online. All articles about measuring performance in Business Intelligence.